Success of a business is largely driven by the efficiency of its processes, effectiveness of its manufacturing infrastructure and aptness of its individuals. Combined together, these factors are also responsible for a well designed plant and a carefully established manufacturing process. A well designed engineering process and an optimally working plant are vital to the smooth sailing of your manufacturing units and in turn, your business’ success. At GTS Engineering USA Incorporated (GTS), we offer advantage of our process and plant engineering expertise to enable our customers to improve productivity of their plants. At the same time, we ensure that all the implicit goals of your plant, such as safety, quality, performance, dependability, efficiency and operability are consistently met. We also take care of all the compliance and regulatory aspects while assisting you with our plant and process engineering services. 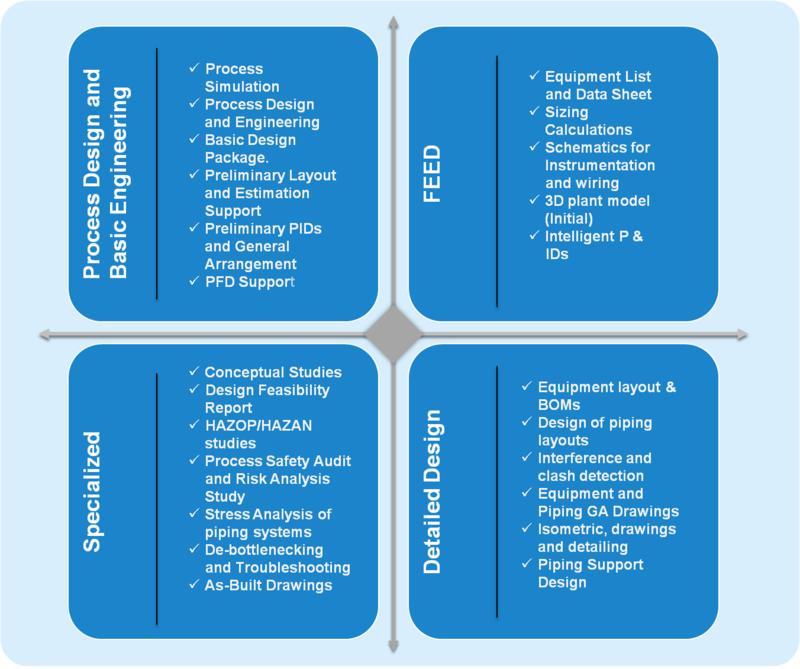 Our process design and basic engineering services include simulation of process using adequate tools upon a careful analysis of requirements. This gives you an early view of various steps, activities, and events participating in a process. During process design and engineering, we consider physical properties of materials and constraints associated with the process under question. We also offer Basic Design Package (BDP), which consists of several useful artefacts, such as project design basis and process description, process and utility flow diagrams etc. Our experts also create preliminary layouts of your prospective plant and assist you with the cost, time, scope and schedule estimates. In addition, we create preliminary PIDs (Piping and Instrument Diagrams) and process flow diagrams (PFDs) in order to give you a basic representation of the overall preliminary process design. A plant and process engineering project requires a number of diagrams, feeds, data sheets and lists to be generated. These artefacts serve as building blocks while carrying out phases of an engineering project. Our professionals have extensive experience in creating equipment lists and data sheets with their specifications, performing sizing calculations for optimum results, developing schematics for instrumentation and wiring, generating 3D plant models, and creating intelligent P & ID (Piping and Instrument Diagrams). These models, sheets and diagrams are crucial to detailing of the design and optimization of the design given all the constraints. Detailed design involves detailing of the designs and layouts prepared at the preliminary stages. During the detailed design phase, we create equipment layouts and BOMs (Bills of Materials), detail up the piping layouts and piping support designs while generating equipment and piping GA drawings in detailed and isometric fashions to give realistic idea of their designs. In addition, we employ standard techniques and modern tools to perform interference and clash detection. GTS helps with conceptual studies of your project to identify the optimization points, potential risks, feasibility, safety issues and possible bottlenecks. We also perform feasibility study of your process and plant design to generate a design feasibility report to help you make well-informed decisions about your design. We are instrumental in performing HAZOP and HAZAN studies for our customers to identify and analyze possible hazards and deviations from the standard operating conditions. In addition to hazard analysis, we undertake process safety audit and risk analysis to estimate risk and unearth safety issues at early stages itself. Our specialized services include stress analysis of piping systems using the modern tools and proven techniques as well as identification and removal of bottlenecks, and troubleshooting as per the clients’ requirements. We also assist our clients by creating As-Built Drawing to give them an almost accurate pictorial idea of the finally built plant at an earlier stage. These drawings enable them to visualize the appearance and functioning of their plant, and help them make crucial business decisions about adequacy of their investments and future steps.